Subscribers to the INSIDER newsletter will have read about the abortive bid by AMEC for the Kentz corporation in August this year, reported in the September newsletter, page 6. Now in the UK’s Times newspaper, it is reported that AMEC has turned its attention to the possible acquisition of US based Foster Wheeler! GB based AMEC commented in August that it was keen to expand in the oil and gas sector, so Foster Wheeler obviously meets that requirement. If the deal goes ahead, it could create an overall energy services group worth $8 billion. AMEC advisors are Goldman Sachs. The Honeywell User Group meeting held in Nice this month for customers across the Europe, Middle East and Africa region was in fact the 25th anniversary of this annual get-together, and as usual featured a review of their current developments from both Darius Adamczyk, the president and ceo of Honeywell Process Solutions, and from Jason Urso, his chief technical officer. Several new product launches were featured, in various different ways! For more information on that you need to consult the INSIDER Newsletter for November, being dispatched today, which carries an extensive report. But perhaps following the tradition established by Jason Urso with his “Starship Enterprise Orion” rôle plays, there was a brief glimpse of a new character at the end of his presentation, “DynAMo man”. On December 4 HPS will launch a new suite of workflow processes and procedures to assist operators of process plants, in order to increase plant reliability and uptime, by supporting the operators in their decision making – since process upsets are reported to be caused 42% of the time by operator error or incorrect actions, after alarms are raised. DynAMo man was much in evidence at the HUG meeting in Nice, in his hunky “Spiderman” type uniform, and may possibly be the image that is attached to helpful hints on the operator screens in the near future. 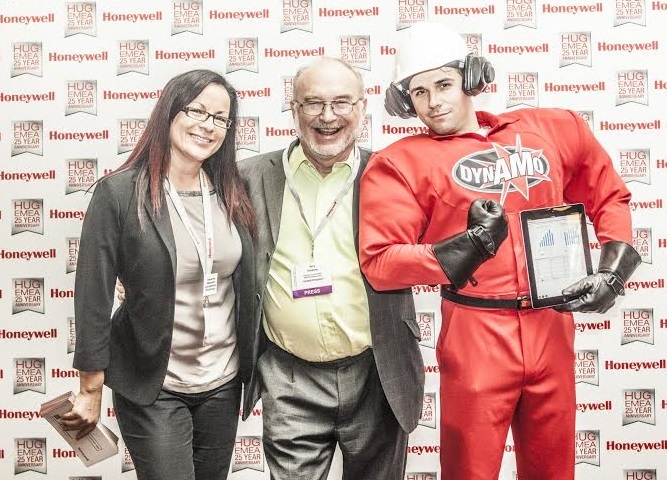 In the picture below DynAMo man is entering into the spirit of the HUG too, with your long suffering Editor, and also Liliana Pereira, from HPS Advanced Solutions marketing communications, the force behind DynAMo man’s Alarm Suite. It’s a hard life doing all this reporting and things. 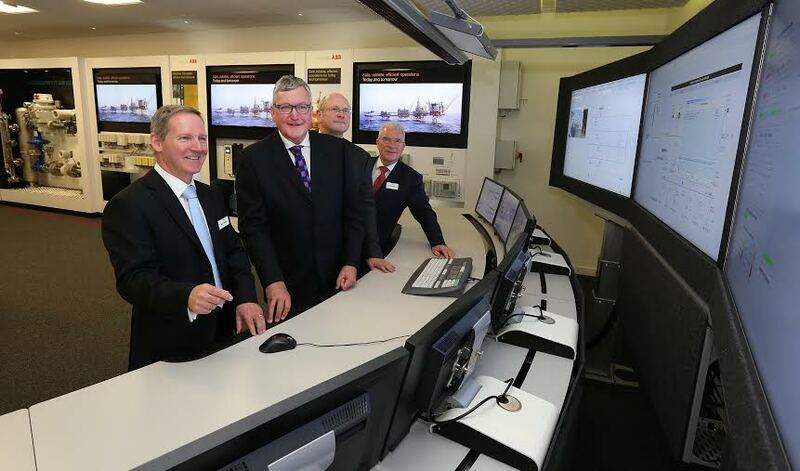 On Monday 18 September, Fergus Ewing, Scottish Minister for Energy, Enterprise and Tourism officially opens ABB’s new facility in Aberdeen, Scotland following a GBP3.5m upgrade. The Altens site is the headquarters for the power and automation technology company’s UK service businesses, bringing together its oil & gas and marine services, spare parts and logistics, turbocharging and consulting activities. The move to the 27,000 sqft bespoke facility, from the city centre’s Commerce Street, accommodates an advanced learning centre for employees and customers, an automation build and test staging area and upgraded turbocharger workshop. The site also houses ABB’s consulting services team. Consulting helps customers to improve the performance of their total operation in the areas of process safety, integrity management and reliability. Typical services include asset life extension, decommissioning, process safety risk assessment and management, alarm management, technical training and specialist technical engineering. Increased capacity has enabled a 30% growth in staffing levels. This provides the resources to achieve ABB’s goal to penetrate its own installed base and grow revenues from around 17 to 25% of group revenues by 2015. ABB in Aberdeen now has 140 employees comprising 100 engineers, consultants (on- and off-shore) and support staff. It also continues to grow its graduate programme, developing its engineers for the future. The company will continue to recruit engineers in 2014. The learning centre supports the development of the skills required now and into the future to operate, maintain and extend the life of automation systems. The centre includes ergonomically designed interactive control room screens which aim to improve the safety and efficiency of operators by providing detailed and timely plant information. The centre also focuses on specific technologies such as instrumentation, electrical equipment including motors, drives, intelligent switchgear and advanced protection systems. ABB’s D3 collaboration desk, also in the learning centre, allows users to see real-time process data and key performance indicators, alongside other documents from various sources. Demonstrations running on the desk illustrate how the different functions in an operating company can collaborate to improve performance or manage process excursions or incidents. The desk shows how the wide range of ABB’s offerings are brought together to help its customers improve their operating effectiveness. ABB’s staging area continues to grow and now houses several scale replicas of the actual control and safety systems in use on specific customer assets. This allows ABB to perform thorough testing of software and its integrity prior to its release to site. This provides the confidence that design specifications and safety standards have been met thus reducing the work required to install and commission onshore. The facility also enhances preparation for planned offshore visits and improves the level of operational support provided from base to facilitate technical troubleshooting and maintenance. Some 80% of the turbocharger population, in the supply and offshore specialist vessels, have ABB turbochargers. To support the growing demand and the new advanced turbochargers, ABB has also expanded the capacity of its turbocharger workshop. The 5,800 sqft turbocharger workshop now accommodates the most advanced testing and repair facilities to support a highly responsive service to ABB customers. The site also provides a third location for ABB’s consulting services, following on from Billingham and Daresbury. Consulting specializes in customer process improvement, aging and life extension, alarm handling and functional safety management. Siemens is opening the first Junior Factory for apprentices at its award winning facility in Congleton, launching during the Government’s flagship ‘Tomorrows Engineers Week’. The facility was opened by UK and Ireland Chief Executive Roland Aurich on the 7th of November and will act as a ‘small factory within a factory’ run by a mixture of commercial and technical apprentices aged 16 to 21. The apprentices will take on key leadership roles and will be responsible for the full breadth of the factory’s progress. The initiative will be open to all apprentices and graduates as part of Siemens’ dedicated plans to train young people not just in the critical field of engineering but also in real business management. The Junior Factory will manufacture a sub-assembly for supply into production, which were previously imported and will represent a re-shoring of domestic manufacturing. The team will be responsible for sourcing and supply chain management, production of sub-assemblies, quality management, budgeting and transfer pricing alongside performance management. Siemens has appointed a head of the Junior Factory and the team has written a business case about how they see the factory working, which was presented to the senior management board earlier in the year. Initially the Junior Factory will be responsible for the complete supply chain for assembly of fans for use within Siemens G120C drives and the team will have complete ownership for the value chain: planning, sourcing, assembly and delivery of finished product to the line. The apprentices will also be responsible for resourcing the factory and ensuring that customer demands are fulfilled in the most cost effective way. Appropriate quality checks should be implemented within the process to ensure that “quality” products are delivered. The team will also be responsible for the creation of an annual budget for the factory. This will include a presentation to the senior management team for approval of the costs and a productivity challenge will be given to the Junior Factory on an annual basis. Honeywell has been selected by the Sinopec Maoming Company to provide business management and automation technology that will rejuvenate and improve the operational performance of the aging Sinopec petrochemical plants in Guangdong Province, China. Honeywell’s Profit Suite R400 process optimization software will be deployed at two of the Maoming Company ethylene-cracking facilities, helping to improve plant performance by increasing energy efficiency, improving flexibility of its operations, and maximizing the plants’ yield of high-value products. The plants have been in operation for more than 50 (fifty) years and currently produce 1 million tons of petrochemicals a year. Ethylene is an important building block for petrochemicals and is primarily used in the manufacture of polyethylene, which, in turn, goes into a wide range of products, such as packaging, detergents, synthetic lubricants and synthetic rubber. In China, about 70 percent of its polyethylene is used in product packaging. Profit Suite R400 is the most comprehensive release of Honeywell’s Advanced Process Control (APC) and Optimization technology portfolio, with the ability to integrate with many different distributed control systems (DCS) by multiple manufacturers, as well as legacy systems. With an installed base of more than 30,000 control systems, Honeywell technology runs mission-critical applications in refineries, chemical plants, pulp and paper mills, pipelines, power plants and other industrial facilities worldwide.